Having production capacity of more than 7000mt per annum for Coconut Shell Powder, we cater to the needs of varied industries. This Coconut Shell Powder is packed in 50 kg. gunny and HDPE bags. Our Coconut Shell Powder is used as an absorbent with surface finishing liquid products. It is used as a raw material for Activated Carbon industries. It is extensively used as compound filler in the manufacture of Phenolic molding powder (Bakelite plastic) as a filler & extender. It is used as a filler for synthetic resin glues. It is used successfully with specialized surface finishing liquid products (as an absorbent), Mastic adhesives, resin casting and bituminous products. It is used in heavy duty hand cleaner pastes as a mild abrasive. It can give a smooth and lustrous finish to moulded articles, and also improve their resistance to moisture and heat. In the Granular form, it is used as a Lost Circulation Material in Oil Well Drilling. It is used as a mild abrasive in shot blasting of delicate objects and of historic buildings. In Asia, it is widely used for the manufacture of insect repellent in the form of mosquito coils and also in Agarbathis, due to its long and uniform burning qualities. The product finds extensive use in plywood and laminated boards as a phenolic extruder and as a filler in synthetic resin glues. Since it has good durability characteristics, high toughness and abrasion resistant properties, it is suitable for long standing use. The shell is similar to hard woods in chemical composition, though lignin content is higher & cellulose content is lower. 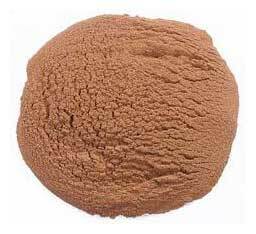 Coconut Shell Powder is preferred to other alternate materials available in the market such as bark powder, furfural and peanut shell powder because of its uniformity in quality and chemical composition, better properties in respect of water absorption and resistance to fungal attack.